John Brown's Raid on Harpers Ferry -- The Coppoc (Coppock) Cousins. Some time in the 1950s, young Tom Stratton came to visit his Grandfather George and Granmother Melva Stratton at what today is Stratton House Inn. While there, he found a rifle tucked behind the door in the entrance-way to the house. When Tom asked his Grandmother about the rifle, she dismissed it, saying, "It had been owned by one of the Coppock cousins, and may have been used at Harpers Ferry." At the time, Tom didn't know who the Coppocks were, but he remembered what his grandmother had told him, and he continued to have an interest in the rifle. It subsequently was moved from the entrance-way, and placed under the floor-boards in the attic. That's where the rifle was being stored when it was retrieved a few years later, and given to Tom's father -- who, in turn, gave it to Tom. "As near as I can tell at this point, the rifle is not rifled, the barrel is octagonal and appears to be cut down to 32"; and the caliber appears to be .38 or .40. There is a patch box on the stock, so I suspect that it originally was a flintlock and that it was converted to a percussion cap. I feel pretty certain that the gun was made somewhere around 1840, probably by a small local gunmaker in Central Pennsylvania - Bedford, Chambersburg, Lancaster area. There is a name, C. Weber, on the patchbox. Weber appears to be a common name in that part of PA. The caliber is too small to have been used regularly as a military weapon. The gun was probably meant for small game up to deer." 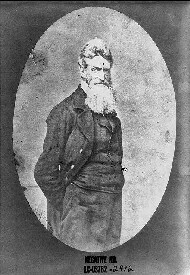 John Brown had assembled an arms depot in Chambersburg, Pennsylvania, which contained 200 Sharps rifles, an equal number of pistols, and a thousand pikes. After establishing his base of operations on a farm about five miles outside Harper's Ferry, Brown had this "freight" delivered to the farm. It is possible that Barclay carried the rifle found in Stratton House with him to Harper's Ferry. There, even though later armed with a Sharps rifle and a pistol, he may have carried this trusted rifle as a backup. Shortly after the raid, Barclay wrote to Franklin Benjamin Sanborn of the Secret "Six" conspiracy to bring him up-to-date on developments. Barklay noted that five raiders had escaped, namely Owen Brown, Charles Plummer Tidd, Francis Jackson Meriam, Osborn Perry Anderson, and himself. Barklay stated that three of them stayed together until they reached Centre County, Pa., where they bought a large shipping box and packed up all heavy luggage, such as the rifles they had salvaged from the farm near Harper's Ferry. Barklay stated that at that point, Owen Brown and Charles Plummer Tidd "went on foot towards the north-western part of Pennsylvania" while he [Barklay] took the large box by train back to Ohio. See photo of Barclay at right. In a book published in 1861, "A Voice from Harper's Ferry," Osborn Perry Anderson confirms that Barclay Coppock accompanied the "box of rifles" back to Ohio. What happened to them there is unknown. Great Grandfather John Stratton built Stratton Flour Mill, which his son, George, subsequently ran for more than fifty years. Great Grandfather John was a second cousin of Edwin and Barclay Coppoc(k), both of whom participated in John Brown's Raid on Harpers Ferry. Edwin was captaured at Harpers Ferry, and was hanged on 16 December 1859. Barclay escaped, but subsequently was killed fighting in the Civil War. Two days before Edwin's execution, he wrote a "last" letter to his Uncle Joshua Coppock, in Salem Ohio. That letter is included elsewhere in this entry. For this reason, the following geneology also includes Joshua Coppock. See photo of Edwin at right. Note: The following entry does not discuss the role of Barclay Coppoc, who was the youngest member of John Brown's raiders. John Brown ordered Barclay to stay behind and provide a "rear guard." As a result, Barclay was able to escape and return to his home in Iowa. There, members of the community united to protect Barclay from being arrested. However, he eventually had to flee to Canada. When the Civil War started, he joined the Union army and was killed early in the war. Edwin Coppoc was born near Salem, Ohio, on 30 June 1835. His father died when he was a child. Edwin lived many years with his grandfather, going to district school and working on a farm. He is described as a studious, industrious boy of cheerful disposition. His eyes and hair were brown and his skin fair. He was fond of athletic sports and was intelligent, active, brave, loyal and the soul of honor. He had winning manners, was amiable, generous and kind. Anne Brown says of Edwin: "He was a rare young fellow, fearing nothing, yet possessed of great social traits, and no better comrade have I ever met." His mother was a woman of unusual intelligence and force of character. She strongly opposed the determination of her sons to enlist in the desperate enterprise. She had married again and her sons were living with her in Springdale, Iowa, when John Brown and his men came there to prepare for the Virginia invasion. Her boys eagerly listened to the story of the wrongs and cruelties inflicted upon the helpless slaves, as eloquently told by John Brown, and longed to help them to freedom. Edwin and his younger brother, Barclay, at last determined to join the young men who were drilling at the Maxson farm and to follow wherever the old liberator should strike the nest blow for emancipation. On the 15 July a letter came from John Brown requesting them to come on to Chambersburg, Pennsylvania. On the 25th they bade their mother goodby and started ostensibly for Ohio. But their mother was not deceived; she knew too well their destination and expected never to see them again. Order No. 9, made out by Captain Brown the day of the attack, details "Lieut. Albert Hazlett and Edwin Coppoc to hold the armory opposite the engine house after it is taken, remaining there until morning, when further orders will be given." The fight began early in the forenoon and Brown was so hotly engaged that his usual good judgment failed him and he did not realize the great peril until his little band was hemmed in on all sides by overwhelming numbers and retreat to the mountains was impossible. His detachments, widely separated, stood at their posts with great courage. One by one they fell before the volleys pouring in upon them from every side. We hear of Edwin Coppoc standing at his post at the armory gates, while balls rained around him like hailstones. Soon after he joined Brown at the engine house and the siege began. Watson and Oliver, sons of the leader, were mortally wounded, but Watson fought on to the last. John Brown, his dieing son Watson, Jerry Anderson, Edwin Coppoc, Dauphin A. Thompson, Steward Taylor and Shields Green were now the only survivors left on the Virginia side. Escape was impossible, and they determined to die fighting, knowing that no mercy would be shown them as prisoners. Col. Robert E. Lee, who was now in command of their assailants, sent a message to Brown demanding his surrender. Few know how near the coming Southern Confederacy came to losing its greatest military leader at this moment at the hands of Edwin Coppoc. Edwin saw from his port-hole the blue uniform of the commander and instantly drew a deadly bead on Lee at close range. 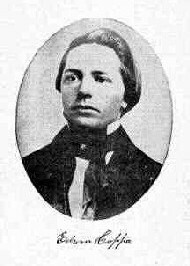 Jesse W. Graham, one of Brown's prisoners, who was watching Coppoc, knew Lee and saw his danger. Instantly springing forward he caught the rifle before Coppoc could fire and during the struggle Lee stepped out of range, and so lived to lead the Confederacy during the Civil War. "Eleven of our little band are now sleeping in their bloody garments with the cold earth above them. Braver men never lived; truer men to their plighted word never banded together. As our comrades fell we could not minister to their wants as they deserved, for we were surrounded by troops firing volley after volley, and we had to keep up a brisk fire in return to keep them from charging upon us. Watson Brown was wounded on Monday, at the same time Stevens was, while carrying a flag of truce; but he got back to the engine house. He fought as bravely as any man. When the fight was over he got worse. He and Green and myself were put in the watch-house. Watson kept getting worse until Wednesday morning, and begged hard for a bed, but could not get one. I pulled off my coat and put it under him and placed his head in my lap, and in that position he died,...Whatever may be our fate, rest assured we shall not shame our dead companions by a shrinking fear. They lived and died like brave men; we, I trust, shall do the same." On the 19th Edwin Coppoc, Green and Copeland were taken to Charlestown jail, which was guarded by State militia with two cannon trained on it. Edwin's trial began on the afternoon of 1 November and ended the following day with conviction. He was sentenced to be hung on 16 December. He bore himself bravely through the ordeal and calmly awaited his doom. He and Cook were confined in the same cell and were very warm friends. 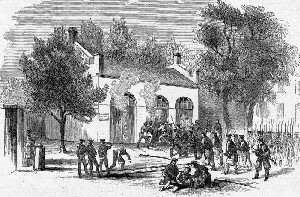 [Cook had been captured outside Harpers Ferry after the raid, and also had been sentanced to death.] Great sympathy was felt for Edwin Coppoc and it was not confined to his Ohio and Iowa friends. Even Governor Wise [of Virginia] could not refrain from expressing his admiration for his noble bearing through all the trying scenes of the battle, surrender, trial and conviction. He asked no favors, made no complaints, but calmly accepted the consequences of his heroic effort to free the slaves. He faced his awful doom without a murmur. His grandfather and Uncle Joshua from Salem, Ohio and Thomas Gwynn, of Cedar County, Iowa, went to Virginia to appeal to Governor Wise for a commutation of his sentence to imprisonment, and to his credit let it be known that the Governor made such a recommendation to the Legislature, as, in cases of treason, he had not the power to interfere. A committee of that body recommended the commutation, but the Virginia Legislature demanded his death. Shields Green managed to secrete an old knife when captured, which he now gave to Coppoc. Edwin contrived to notch the blade into a rude saw. With this he and Cook sawed the shackles from their limbs and digging a hole through the brick wall of their cell the night before execution, made a bold strike for freedom. But the guards discovered them as they crept out and returned them to their cell. The few remaining hours of their lives were spent in writing farewell letters to their friends. The morning of their last day dawned upon Cook and Coppoc. They were as calm and brave in death as they had been through the two days of fierce battle. Their comrades, Green and Copeland, were executed at 10:30 a.m., December 16th, and at half-past twelve Cook and Coppoc were taken from their cells. they were permitted to bid Hazlett and Stevens goodby on their way to the scaffold. When the black caps were drawn over their heads they clasped each other's hands in a last farewell and calmly met their doom. Edwin's body was taken by his friends to his boyhood home at Salem, and there laid to rest among his kindred. I seat myself by the stand to write for the first and last time to thee and thy family. Though far from home and overtaken by misfortune, I have not forgotten you. Your generous hospitality towards me, during my short stay with you last spring, is stamped indelibly upon my heart, and also the generosity bestowed upon my poor brother who now wanders an outcast from his native land. But thank God he is free. I am thankful it is I who have to suffer instead of him. The time may come when He will remember me. And the time may come when He may still further remember the cause in which I die. Thank God the principles of the cause in which we were engaged will not die with me and my brave comrades. They will spread wider and wider and gather strength with each hour that passes. The voice of truth will echo through our land, bringing conviction to the erring and adding members to that glorious army who will follow its banner. The cause of everlasting truth and justice will go on conquering and to conquer until our broad and beautiful land shall rest beneath the banner of freedom. I had fondly hoped to live to see the principles of the Declaration of Independence fully realized. I had hoped to see the dark stain of slavery blotted from our land, and the libel of our boasted freedom erased, when we can say in truth that our beloved country is the land of the free and the home of the brave; but that cannot be. I have heard my sentence passed, my doom is sealed. But two more short days remain for me to fulfill my earthly destiny. But two brief days between me and eternity. At the expiration of those two days I shall stand upon the scaffold to take my last look of earthly scenes. But that scaffold has but little dread for me, for I honestly believe that I am innocent of any crime justifying such punishment. But by the taking of my life and the lives of my comrades, Virginia is but hastening on that glorious day, when the slave will rejoice in his freedom. When he can say, "I too am a man," and am groaning no more under the yoke of oppression. But I must now close. Accept this short, scrawl as a remembrance of me. Give my love to all the f amily. Kiss little Joey for me. Remember me to all my relatives and friends. And now farewell for the last time.